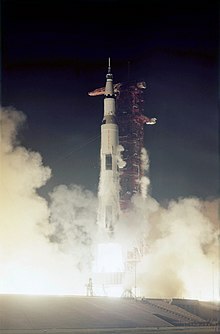 Apollo 17 was the first night launch of a U.S. human spaceflight and the final manned launch of a Saturn V rocket. 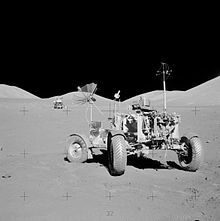 It was a " J-type mission" which included three days on the lunar surface, extended scientific capability, and the third Lunar Roving Vehicle (LRV). 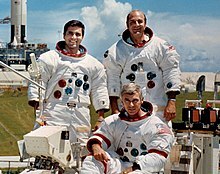 While Evans remained in lunar orbit in the command and service module (CSM), Cernan and Schmitt spent just over three days on the Moon in the Taurus–Littrow valley and completed three moonwalks, taking lunar samples and deploying scientific instruments. 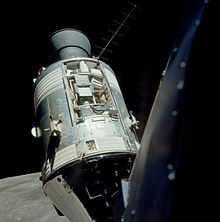 Evans took scientific measurements and photographs from orbit using a scientific instruments module mounted in the service module. 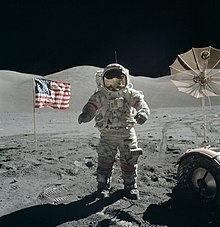 The song " Contact" from Daft Punk includes audio from the Apollo 17 mission, courtesy of NASA and Captain Eugene Cernan. ^ Brzostowski, Matthew; Brzostowski, Adam (April 2009). 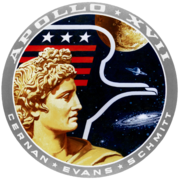 "Archiving the Apollo active seismic data". The Leading Edge. Tulsa, OK: Society of Exploration Geophysicists. 28 (4): 414–416. doi: 10.1190/1.3112756. ISSN 1070-485X. Retrieved June 12, 2014.